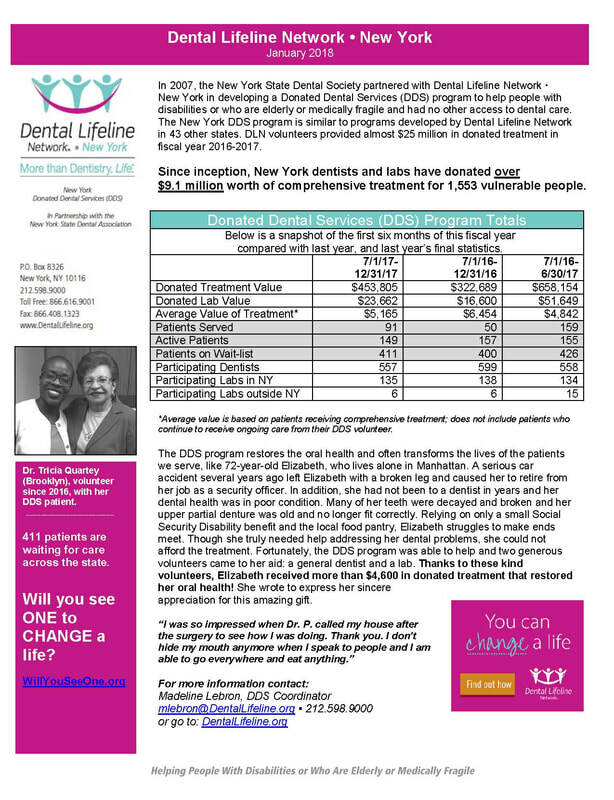 ​June 2016 - Dental Lifeline Network  New York (DLN) through its Donated Dental Services (DDS) program has helped nearly 1,400 vulnerable people with disabilities or who are elderly or medically fragile and have no other way to get dental treatment. Since 2003, these individuals have received almost $8 million in comprehensive care from a volunteer network that has grown to 611 dentists and 140 dental laboratories. The New York DDS program is one of 43 DDS programs nationwide that this fiscal year will generate $24.5 million in free dental care. Collectively since 1985, 110,000 people across the country have accessed almost $325 million in free dental services through the DDS program. The Donated Dental Services (DDS) program is a collaborative, direct way that the dental profession reaches out to individuals with special needs.Because of the extraordinary compassion of over 13,000 dentists and 3,000 dental laboratories across the country, DDS tends to the essential and comprehensive dental care needs of our nations most vulnerable people; disabled, elderly or medically-compromised individuals who cannot afford necessary treatment nor get public aid. DDS patients have slipped through the cracks of Medicaid and Medicare programs with nowhere else to turn. Participation could not be easier. Dentists and labs take care of the patients, DDS does everything else; no headaches, no red tape. DDS Coordinator is the liaison between the patient, the labs and the dentists, answering any and all questions, assisting the patient, the lab and the dentist with anything and everything. The goal of DDS is to return patients to good oral health, enabling them to reach an affordable maintenance level.